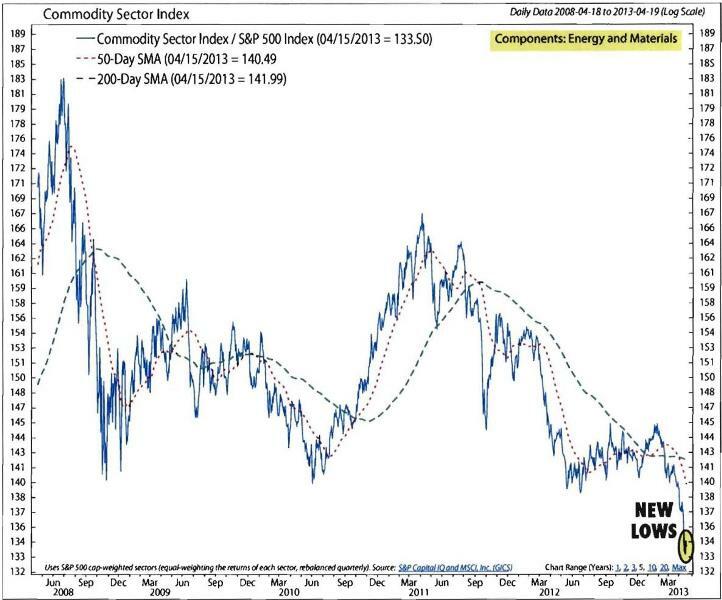 - In the face of all the widely publicized monetary easing and currency printing occurring globally, the commodity sector as a whole has been correcting downwards since about 2008, and has not provided much in the way of upside opportunities for commodity/inflation oriented investors over the last five years. In fact, it has broken to new technical lows as of April 2013, implying even further weakness over the near term. We remain steadfast in our fundamental belief that paper currencies will continue to lose relative value over time versus what we define as “hard assets”, which includes to our mind almost all commodities. We define ‘hard assets’ as tangible things, such as gold, platinum, silver, copper, soybeans, coffee, cotton, real estate, copper, oil, wheat and rice. 1.) This deflationary pressure is coming from the excessive levels of Debt/GDP which has built up in the developed economies of the US, Europe and Japan over the past 30 years. 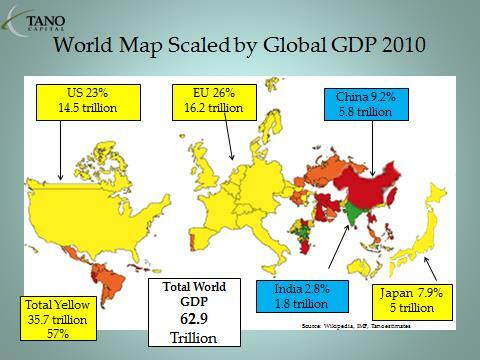 Those three economies taken as a bloc represent about 60% of global GDP (as of 2010) and over 75% of total global marketable debt outstanding. These developed economies are structurally sick, and are suffering from low to no growth by their far too high existing debt “sea anchors”. Adding more leverage to the already over-levered developed economies will produce very limited incremental boosts to GDP. 2.) The debt in the developed world got too high in the first place because of the long term deflationary labor dividend provided by the emerging BRIC’s, which enabled simultaneous high growth and low inflation in the developed world, which enabled interest rates to continue falling virtually uninterruptedly for the past 30 years, and which encouraged ever more debt financing. Both of these long wave trades are in the process of ending. 8.) by choosing to reflate instead of de-lever, the central banks are trying to get the already too levered financial systems of the US, Eurozone and Japan to add even more toxic debt on top of the existing debt. They are using unemployment as the benchmark for when to stop the monetary easing. Creating more debt will not at the margin create a lot more GDP in the developed world as we will demonstrate, so most likely unemployment is going to remain high and sticky no matter how much more new money they print. The most likely scenario is they will continue to ease and print money and have zero interest rates for far too long. The current policy of printing more and more money will most likely not materially change unemployment rates in the developed world and eventually, as the global money supply continues to grow, we will hit a tipping point, and inflation will begin to accelerate in a rapid manner. At that point gold will start to shine again. 11.) Demand for gold has been coming from retail investors for jewelry and central bankers. China and India are the two largest consumers of gold annually, and account for more than 51% and rising of total annual gold consumption. As per capita income continues to rise in the BRIC’s and other frontier markets, and the global money supply continues to expand, gold demand will remain robust, and gold will maintain its long term purchasing power. These numbers are not exactly all as of the same date in time, but they are accurate enough in terms of their relative comparative magnitudes for purposes of this analysis. The GDP (the red box in Chart 4) , or Gross Domestic Product, number may be thought of as a “revenue” concept for the US economy as a whole e.g. it means that there is some amount of the $15 trillion available to service the debt, but nothing close to the whole amount. The $115 trillion in debt is composed of two items, $54.1 trillion in listed, traded and measurable debt, and approximately $60 trillion in “off balance sheet” debt which is comprised of estimates of future claims on the US government for Medicare, Medicade, Social Security, military pensions etc. The US Government does not employ GAAP, or “generally accepted accounting principles” when doing its own books, hence it does not publish statistics regarding its future potential liabilities. It simply pays them as they come due year by year in the current accounts. The estimated current total off balance sheet debt of $60 trillion above therefore comes from estimates made by non-governmental sources. The main take away for us is this: you have an economy generating approximately $15 trillion in revenue or cash flow on the one side, and you have debt owed by it of $115 trillion on the other side. 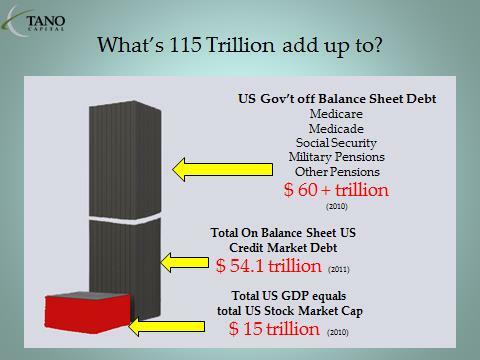 The principal and the interest on $115 trillion therefore have to be serviced by the $15 trillion. The US GDP of $15 trillion is currently growing at about 2.5% per year, while the liability side of the equation ($115 trillion) has grown at 8 – 10 % per year for the last ten years, and shows no signs of slowing down from past growth rates at present. So let’s think about it another way. If interest rates are 1%, then the annual interest only cost of the current debt pile is about $1.1 trillion per year, with no principal amortization. If interest rates are 5%, then our interest only payment for one year would be $5.75 trillion; and at 10% $11.5 trillion. As GDP is revenue, and not an income concept, we could not possibly take even 1/3 away to service existing debt without severely cramping future growth prospects for the economy as a whole. Taxes have averaged about 18% of GDP over the last 66 years or so , which equates to roughly $2.7 trillion on the current GDP. It is hard to envision paying taxes and additional debt service on top of that of even the same amount as is paid for taxes, for then you would have $2.7 plus $2.7 or $5.4 trillion out of $15 trillion, or a third of the economy’s revenue just going to service the government and the debt. Conclusion: There is already far, far, far too much existing total debt, for the current size and growth rate of our economy. The existing debt is also growing much faster year on year than the economy (10% versus 2%). Our economy has become too levered, more leverage from current nosebleed levels is likely to be simply counterproductive and yet in spite of this the current mismatch between the size of the debt and the size of the economy continues to grow year on year in the wrong direction. It is not a stable situation, and until it has been gotten under control with some credible longer term solution, it will continue to breed ever more financial market instability. Europe and Japan have identical debt issues of identical magnitudes. So how did we get in this mess? As you can see from the Chart 5, total credit market debt as a percentage of GDP stayed at relatively manageable levels up until the 1980’s. There was a large spike in 1930-1935, primarily due to the implosion in GDP during the Great Depression. Total Debt vs. GDP muddled along at manageable levels for the next 40 years, until something changed in 1982, and debt began to rise inexorably to the present day unsustainable levels. So What Happened in 1982? Chart 6 above shows on top US Core consumer prices and on the bottom 10 year US Govt bond yields, from 1970 to 2010. The US completely cut the chord and went off the gold standard in 1971, (the yellow arrow) ending the exchangeability of paper currency for gold. In order to understand what fundamentally changed in 1982 that kicked off the ensuing massive leveraging, we actually have go back a bit further in time to review what’s now known as “The Nixon Shock” in 1971. “…The Nixon shock was a series of economic measures taken by United States President Richard Nixon in 1971 including unilaterally canceling the direct convertibility of the United States dollar to gold. It helped end the existing Bretton Woods system of international financial exchange, ushering in the era of freely floating currencies that remains to the present day. In 1944, the Bretton Woods system fixed exchange rates based on the U.S. dollar, which was redeemable for gold by the U. S. government at the price of $35 per ounce. Thus, the United States was committed to backing every dollar overseas with gold. Other currencies were fixed to the dollar, and the dollar was pegged to gold. For the first years after World War II, the Bretton Woods system worked well. Japan and Europe were rebuilding from the war, and foreigners wanted dollars to spend on American goods - cars, steel, machinery, etc. Because the U.S. owned over half the world's official gold reserves - 574 million ounces at the end of World War II - the system appeared secure. However, from 1950 to 1969, as Germany and Japan recovered, the US share of the world's economic output dropped significantly, from 35 percent to 27 percent. There was less demand for dollars and more demand for deutsche marks, yen, and francs. U.S. spending on the Vietnam war and domestic social programs flooded the world with dollars. Back to our story. As we have seen, the 60’s and 70’s were a difficult time in the US, culminating in it completely cutting the cord between the dollar and gold. The ensuing devaluation of the dollar stoked inflation in mid to late 70’s, as can be seen on the top graph of Chart 6. Annualized inflation peaked out at over 15% per annum in the early 80’s, and then president Jimmy Carter appointed Paul Volker as the new Chairman of the Federal Reserve. Volker didn’t waste any time, he promptly jacked up interest rates to almost 20% (the red arrow on the lower graph on Chart 6 which virtually bought both the US economy and inflation to a screeching halt. As the economy reeled under blistering interest rates, a thorough Hayek-ian shake out ensued with lots of bankruptcies and downsizing. Then came the silver lining. Once the economy slowed, and inflation was back under control, interest rates began to fall. The economy, freshly reset, with debt restructured, began to grow again. It was right about this time that Deng Xiaoping came to power in China, and began laying the groundwork for its future economic rise. The BRIC’s (Brazil, Russia, India, and China) entered the world stage, and provided the global economy with a very large, very hungry and very, very cheap source of new labor. This new, cheap labor source acted as both a strong deflationary wind and a catalyst for economic growth globally. All economies were able to grow rapidly, without the usually attendant inflationary labor cost pressures, because there was just so much new labor available, very eager for work. This newly found, highly deflationary global source of low cost labor, in conjunction with the economic reset forced by Fed chairman Volker is what happened in 1982 that started the great leveraging binge in the US. If you compare Charts 5 and 6 above, you can see that interest rates began a steady 30 year descent in 1982, and as interest rates fell, people were incentivized to borrow ever more. The icing on the cake was that the more they borrowed, the more rates fell, which acted to encourage ever more debt. Global economies began to boom with the entrance of the BRIC’s, and the massive expansion of the pool of available labor enabled that growth to happen without any noticeable uptick in inflation. The global economies entered a sweet spot of rapid growth, with ever lower interest and labor costs and predictably ever increasing stock market prices. Total on balance sheet Debt to GDP rose from 1.5x GDP in 1980 to 3.5x GDP, where it resides now. Unfortunately, these two very powerful underlying positive dynamics of ever cheaper labor and ever lower interest rates have both run out of steam, for different but complementary reasons Wages have started to rise across the board in the BRIC nations, as they have fallen in the developed economies. Both China and India now outsource labor from their own domestic economies to other, lower cost jurisdictions and there are no new emerging large pools of undiscovered and underutilized workers left. China’s surging wages and other costs are showing signs of undermining the competitiveness of the nation’s economy, threatening its growth potential, the Asian Development Bank said. Average inflation-adjusted wages have more than tripled in a decade and non-wage costs for procedures such as hiring and firing have risen since the introduction of a 2008 labor law, the ADB said in a report published today. The labor market is being squeezed across the nation as the pool of working-age people shrank last year. At stake is China’s position as the world’s biggest producer of low-cost goods, while competitors from Vietnam to Mexico stand to gain as investors seek to relocate to countries that have cheaper labor or are closer to big markets in the U.S. and Europe…. Also predictably, over time and with ever increasing systemic leverage, the marginal benefit to growth in GDP from adding incremental additional debt began to deteriorate. If you think about it, it makes sense. $1 dollar of additional leverage boosted GDP quite a bit in an unlevered system, but as debt built up, you had to add more and more to get any incremental growth in GDP at all. 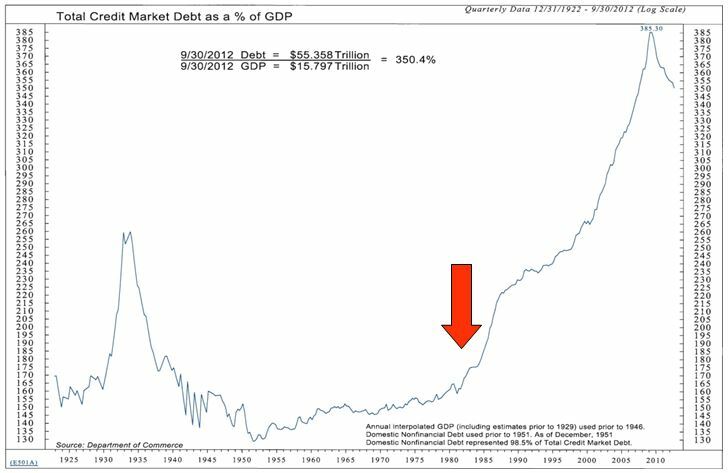 In the 50’s, it took a little over $1 dollar of debt to add $1 dollar of GDP, in the 80’s it took $3 Dollars of new debt to add $1 dollar of GDP, and currently, it takes over $6 Dollars of new debt to add $1 dollar of GDP. More debt is not what the US financial system needs, and the sheer magnitude of the currently existing debt is acting like a sea anchor behind a boat, forcing growth to be sub-par. Too much debt chokes the economic engine, and exerts extreme deflationary pressure on the system. The developed markets economies have become hooked on ever more debt for growth, and now that game is coming to the practical end of its rope. The system cannot keep adding leverage at the same rate it has done in the past, or for that matter any rate at all, the system needs to reset and delever from current levels. Too much leverage breeds instability, and with instability you get financial market distress…. Enter the Global Central Banks….The Debt build up shown in Chart 5 was responsible for creating the conditions that caused the stock market crash of 2008. That crash occurred because the subprime mortgage market imploded (approximately $2.2 trillion of the total $54 trillion listed debt went bad). It was the most severe crash since the Crash of 1929, and was of equal severity and magnitude to 1929 in that stocks lost fully 50% of their value in a period of a little over 1 year. 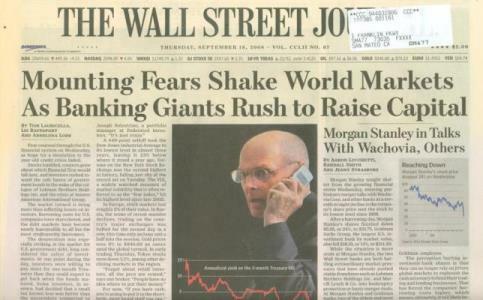 Although it seems like it happened eons ago, it was only five years ago where we were all sitting around wondering if this was really “the end”, as such Wall St. stalwarts as Bear Stearns, Lehman Brothers, Merrill Lynch, AIG and Washington Mutual teetered and fell. The big difference between the crash of 2008 and the great crash in 1929 was that all current central bankers have studied in school ad nauseum what happened in the great depression, and all have concluded that the tight money policies prevailing at that time were counter-productive and contractionary, and acted to make a bad problem worse. In contrast, their 2008 policy response this time was unprecedented, in that every large global central bank acted together in concert to “open the taps, and flood the markets with cash”. They attempted to do this initially by expanding the monetary base. Note that this policy response in essence is a decision to force even more leverage onto and into economies that are already extremely over-levered. As we have seen from Chart 7, the incremental likely response (in terms of marginal GDP growth) of adding even more additional leverage onto the already over-levered developed economies, (US, Europe and Japan) is likely to be tepid at best. The developed world needs to either stop adding leverage, or to grow their underlying GDP’s by much larger annual increments than current run rates suggest. The Central Banks want to stoke up inflation to avoid deflation. Therefore they print money, and encourage the banks to lend, which implies more and more systemic debt, which just kicks the can down the road and sows the seeds of even more future instability in the global financial system. Choosing the inflate option postpones the “reckoning” farther out into the future, and that is the path we are now following. So the Central Banks open the taps…. Chart 9 shows the Monetary Base and its components from 12/01/1970 to 12/01/2012. The monetary base is highly liquid money that consists of coins, paper money (both as bank vault cash and as currency circulating in the public), and commercial banks' reserves with the central bank . As shown in Chart 9, the total reserves provided to the global financial system were increased massively in 2009, in logarithmic not geometric increments. What the central banks found, to their consternation, was that while they could increase the monetary base, they were unable to force the banks to lend and people and corporations to borrow. So while the money supply exploded, the velocity of that money or the turnover of money, collapsed. The reason for the collapse in Velocity stemmed from the mindset of the population during and after the stock market crash in 2008. 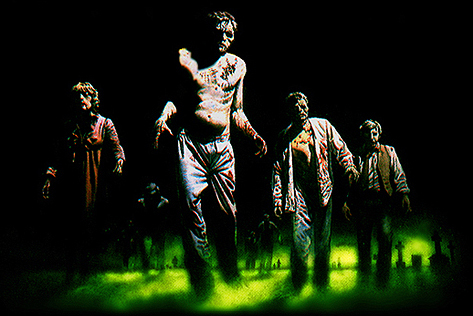 People were scared, and didn’t want to borrow, banks were scared and didn’t want to lend. Banks instead took up some of the free reserves on offer from the central banks, and invested them directly into short duration instruments, such as T Bills, earning a positive carry between the fed funds rate at almost zero and the short term bill rates. They in effect became large hedge funds and leveraged up their own version of the famous “carry trade”. As can be seen on the bottom half of Chart 11, total bank credit or loans (the blue line) went firmly negative in 2009 and didn’t move back into positive territory until almost 2012. Meanwhile, during the same timeframe, portfolio securities held (the red line) went very positive and increased until about 2012. The central banks were not very happy about this state of affairs, since all their pump priming was going straight into the banking system’s balance sheets and doing nothing to rejuvenate economic growth. Hence the collapsing velocity of money as shown in Chart 10. They responded to this churlishness on the part of the banks with what became known as ‘Quantitative Easing’ or QE. QE basically meant that they would start the government presses rolling to print more money, and take that newly printed money and buy government debt directly from the public themselves, which effectively bypassed the banking system entirely. Printing new money and using it to buy up existing debt did three things, it increased the amount of paper currency in circulation, it greatly increased the size of the current balance sheets of the central banks, and most importantly it drove down real yields on short term debt into negative territory, which then made the ‘carry trade’ being employed by the banking system unprofitable. The phrase “Financial Repression” has also been applied to refer to the government forcing interest rates lower than they otherwise would be without government intervention. 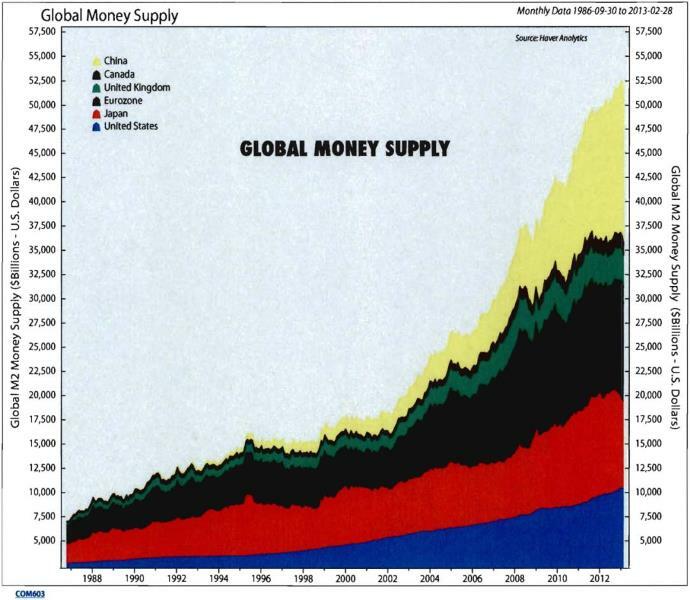 As can be seen on Chart 12, the global money supply (M2) has ballooned from about 20 Trillion to over 52 Trillion during the 10 years from 2003 to 2013. The Federal Reserve’s balance sheet tripled in size from 6% of GDP to 19% of GDP from 2008 to 2012, as did the Bank of England’s. This is governments printing money to buy up their own debt, in effect monetizing it and further pumping up their respective money supplies. Warren Buffett, the billionaire chairman and chief executive officer of Berkshire Hathaway Inc., said he isn’t investing in corporate debt, including Apple Inc. record offering, because yields are too low. Our third non-intuitive outcome is P/E ratios in a zero bound interest rate environment begin to contract. This tells us one dollar received today is not worth as much as it was formerly, because it cannot be reinvested at any type of yield much above zero. P/E’s expanded from the beginning of the great bull market in the early 1980’s until the first crash in 2000, and have been pretty much contracting ever since. Note on the chart above that the last time P/E ratios contracted to current levels was the beginning of the mess in the 60’s and 70’s culminating in the Nixon Shock referenced above. D.) Stocks Yield more than Bonds…. All of a sudden stocks yield more than bonds!!!! The very last time stocks out-yielded bonds occurred fifty years ago in 1963!! Stocks at least offer some degree of inflation protection, so my question is who in their right mind would want to own bonds when they can put together a basket of higher yielding stocks with the added advantage of some inflation insurance? This is clearly also a hidden agenda in the central bankers playbook, they would like to inflate asset prices like stocks so people will feel more affluent and borrow and spend more like the old days. Clearly, liquidity has never had a larger incentive to switch horses, and move from bonds to equities, a move which will most likely happen sooner rather than later. Chart 18 shows long term unemployment data for the US from the 1970’s up to 2010. The massive systemic incremental leverage that has been built up over the last 30 years is now acting as a drag on current and future economic growth, depressing current and future employment prospects. High and sticky unemployment and underemployment are now a fact of life in the over-leveraged developed world globally. When you seek to add more leverage to an already broken system, by pushing interest rates to zero, in a system which is too levered to begin with, your only result is to further weaken the financial structure. As we have seen on Chart 7, any new marginal boost to GDP growth from any further debt growth is likely to be mild at best. Some other observations on zero bound interest rates and the current economic environment: The insurance industry can no longer defease long term annuity products. The mutual fund industry can no longer operate money market funds at a profit. Unfunded defined benefit corporate pension obligations become larger and larger, in many cases threatening the future viability of the enterprise. Government off balance sheet unfunded and undefeased defined benefit pension obligations become ever larger and ever more problematic. Countries now get penalized instead of rewarded for operating their currencies, banking and financial systems in a responsible manner. If you haven’t yet joined the rest of the developed world by deliberately trashing your currency by letting your printing presses run unabatedly, on a relative basis, your currency looks better and better as each new day brings more and more paper masses of Dollars, Pounds, Euros and Yen. If you are still posting positive yields in your bond markets, and your financial books are in good order, your currency is now fair game for the global yield hunting investment fraternity. As investors globally seek havens from the paper storm, the good parking places are all getting taken, and soon there will be no where to park any more. If you want to cut the attractiveness of your currency, you have to cut your domestic interest rates, and they must end up being pretty close to zero to deter the global yield hunters. With zero interest rates, voila, FREE MONEY!!!! A speculators dream come true!!! How long before new domestic asset bubbles start to grow? Certainly, devaluation is a predictable side effect of letting the printing presses run. The problem is that relative devaluation starts causing problems in other countries, who run responsible currency and central banking platforms. One of the early casualties of the budding Currency Wars—Switzerland and the Swiss Franc. As can be clearly seen on the chart above, the Swiss exchange rate started to strengthen in 2008, and by 2011 had appreciated versus the USD by a whopping 35% over less than three years. This was mainly due to speculative external currency flowing into Switzerland seeking a haven from the global paper currency storm. Switzerland’s domestic markets proved far too small to be able to effectively absorb and sterilize the virtual tsunami of cash trying to get in, and domestically based industries suddenly became non-competitive on the global stage at the new exchange rate levels. Swiss authorities had little choice in terms of policy options to combat this new river of cash flooding into their borders, as interest rates were already so low globally that domestic adjustments to interest rates had no effect whatsoever on stemming the tide in. The principal of return of your capital as opposed to return on your capital came to dominate the thinking of global investors. The Swiss eventually did the only thing they could, which was to announce a hard peg of the Franc to the Euro, which forced a massive expansion of their own central bank’s balance sheet. Switzerland was forced at virtual speculative gunpoint to either join the global central banking paper printing train, or suffer a massive internal economic contraction. They finally opted to print, instead of sitting idly by and watching their domestic economy implode. The Brazilian finance minister has been complaining vociferously about Currency Wars and the unfairly strengthening Brazilian Real. Brazil has clearly suffered a massive 80% strengthening of their exchange rate since 2000, and their complaints would appear to be justified. How long do you think it will it be before they take further measures to reduce it? MOSCOW--Brazilian Finance Minister Guido Mantega said Friday that a number of exporting countries are finding it increasingly difficult to compete as others are taking steps to weaken their currencies. "The currency war has become more explicit now because trade conflicts have become sharper," Mantega told Dow Jones Newswires in an interview. "Countries are trying to devalue their currencies because of falling global trade. So many of them are in a difficult situation." Japan has recently elected a whole new government based solely on the premise of trashing their currency to jumpstart internal inflation and economic growth. They have made no secret of their intention to massively print and create new currency, and to expand their central bank balance sheet to unprecedented levels versus GDP. Indeed, they are all but screaming it from the rooftops. As one can see from the graph below, they are having good initial success as the Yen has devalued by almost 20% since the start of 2012. Borrowing costs in emerging markets sank to record lows as Japan’s unprecedented monetary easing spurs demand for higher-yielding assets. Russia to date has not joined the party, but how long do you think they will hold out? Probably not long, as Putin has recently moved to replace his stalwart tight money central banker Sergei Ignatyev with his long time economic advisor and probably much more pliant Nabiullina. Some Ruble weakness in the cards? Australia has not yet joined the printing party either, how long do you think they can hold out? In real, trade weighted terms, the Australian Dollar has appreciated by about 50% versus the US Dollar over three years from 2009 to present. …The RBA predicted below trend 2013 growth on Feb. 8. It lowered its estimate to about 2.5 percent, from about 2.75 percent forecast in November, citing weak investment outside the mining industry and a stronger-than-expected currency. Along with the New Zealand, Canadian, Swedish and other currencies, the Aussie has strengthened since 2008 as nations such as the U.S., Japan and the U.K. reduced rates to near-zero and carried out quantitative easing to boost their economies. And what about the so-called “currency manipulator”, China? As can be seen, contrary to their reputation as a “currency manipulator” they have actually behaved as reasonable global corporate citizens, and allowed the renminbi to appreciate steadily since about 2005. However, if the rest of the world continues on the path they are on now, how long do you think the Chinese will stand still and let everyone else devalue versus the Renminbi? “Beijing has issued a new warning against competitive devaluations by rich countries, saying that emerging markets will pay the price for so-called currency wars. “For the global economy this year, I am worried about inflation, about competitive currency depreciation and about the negative spillover effects of excessive issuance of the main currencies,” commerce minister Chen Deming said on Friday. …China also holds more than $3tn in foreign exchange reserves, the world’s largest, making the country particularly vulnerable to depreciation-related losses. The ultimate effect of “currency wars” will be to put the already out of control global paper money printing on steroids through further expansion of many countries domestic money supplies in order to prevent/fight appreciation of their domestic currencies versus the Dollar, Pound, Euro and Yen. It will be in every countries self-interest to “peg and print” like Switzerland has been forced to do. 8.) by choosing to reflate instead of de-lever, the central banks are trying to get the already too levered financial systems of the US, Eurozone and Japan to add even more toxic debt on top of the existing stuff. They are using unemployment as the benchmark for when to stop the monetary easing. Creating more debt will not at the margin create a lot more GDP in the developed world, so most likely unemployment is going to remain high and sticky no matter how much more new money they print. The most likely scenario is they will continue to ease, and print money and have zero interest rates for far too long, causing currency wars and other unintended and unforeseen counterproductive outcomes. Eventually, as the global money supply continues to grow, we will hit a tipping point, and inflation will begin to accelerate in a rapid manner. At that point gold will start to shine again. Which brings us right back to our opening thesis, which is gold. Some cold gold facts: the total above ground global gold supply, consisting of all known gold mined since antiquity, equates to some 170,000 metric tons. That equates to roughly 6 Billion ounces. At $1650 per ounce, that equates to $ 10 Trillion dollars. Annual demand/supply equates to roughly 3.5 to 4.5 thousand metric tons, (about $230 billion) about half comes out of the ground new from mines and half comes from recycling existing jewelry etc. 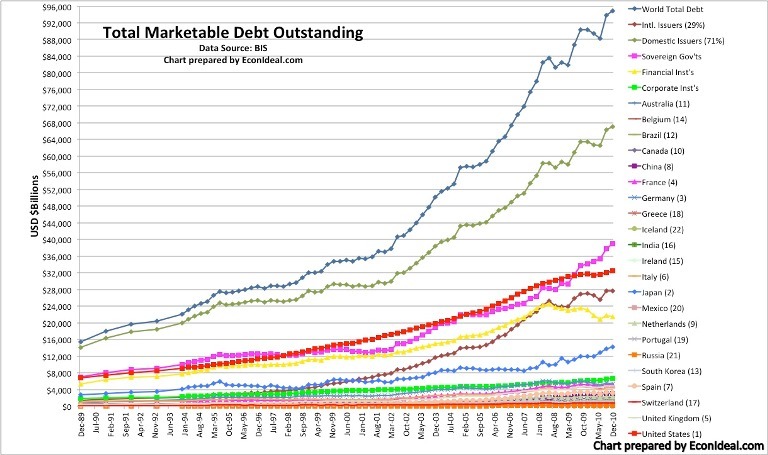 What’s interesting to note is that the total debt skyscraper has been growing at 8-10% per annum, the global money supply about 7.5%  per annum, the US GDP at 2% per annum and the total stock of gold 1.6% per annum. 9.) gold miners have been unable to materially expand the amount of gold they are producing annually; the supply numbers in 2011 look very close to the supply numbers in 2000, when gold was 7x cheaper per ounce; the incremental supply of gold looks to be very, very inelastic to price moves. Let us repeat ourselves, lest the reader skim by this most important point in the gold story. While the price of gold increased roughly 7X from about $250 dollars per ounce to over $1800 dollars per ounce from 2001 to 2011, annual global miner production as shown on Chart 28 barely increased at all. I can assure you it was not from lack of effort on the part of the miners…. It would appear that there is little risk of an avalanche of new gold supply coming up from out of the ground any time soon. So what about the scrap/recycling market as an alternative source of supply? …The prospect of losses has made retailers who buy used gold and the middlemen who sell to refiners unwilling to part with metal purchased at higher costs. Volumes of recycled metal, known as scrap by the industry, dropped 2.6 percent last year as prices retreated from the record in 2011, according to data from the World Gold Council in London. …Slumping prices spurred demand for physical metal, with the U.S. Mint saying April 23 it ran out of its smallest gold coins. Australia’s Perth Mint said volumes jumped to a five-year high. India’s bullion imports may surge 47 percent to 225 tons in the second quarter to meet consumer buying, according to the All India Gems & Jewellery Trade Federation. Imports by China from Hong Kong more than doubled to an all-time high in March…. …Scrap volumes, mostly from jewelry, reached 47.3 million ounces last year, or 37 percent of the 127.3 million ounces of refined supply, according to New York-based CPM Group. The U.S. is the largest scrap supplier, followed by Italy and China. …Sumitomo Metal Mining Co., Japan’s biggest gold producer, is processing little scrap and instead mainly using ore and by- products of copper smelting to supply its bullion refining business, said Masashi Takahashi, a spokesman in Tokyo. A big new incremental avalanche of scrap supply would also appear to be unlikely in the physical gold market, particularly while prices remain well below prior highs. The bars on the Chart 29 above show net purchases and sales of gold by central banks from 2000 to 2012. Above zero equals net purchases, below zero equals net sales. As far as the physical market goes, there appears to be unlimited demand, mostly from the rest of the global central banks who aren’t at the heart of the global money printing storm. In fact, there has not been a central bank sale of gold of any real magnitude since about 2008. The last large seller was the IMF in 2010, since then nobody is selling, and everybody is buying. This chart shows the largest holders of surplus paper foreign exchange reserves (forex) by region globally as of 5/1/2013, (not including gold held as reserves). Of note, China is by far the largest with some $3.4 Trillion, followed by Japan with $1.1 Trillion, Saudi Arabia with $664 Billion, Russia $480 Billion and Brazil with $378 Billion. Total world forex reserves are measured by Bloomberg as of 5/1/2013 at $11 Trillion in PAPER currency. This has grown from approximately $2.3 trillion as of 2003. Predictably, global non-gold paper foreign exchange (forex) reserves have been expanding right along with global money supply at about a 17% per year clip over the last ten years. At the Central Bank level, Gold is measured in units of metric tonnes. One metric tonne of gold = 1000 kilograms = 32,151 troy ounces, which at $1500 per oz equates to roughly $50 million dollars per tonne. China therefore now holds roughly about $50 Billion dollars in gold, which equates to about 1.5% of their $3.4 Trillion total forex reserves. We can apply the same math to Japan, which at 765 tonnes equals $38.2 Billion in gold versus $1.18 Trillion in total or only 3.2% held as gold. Saudi Arabia at 323 tonnes equals $16 Billion or only 2.4% held as gold; Russia with 977 tonnes equals $49 Billion or 10% held as gold; and rounding out the top five, Brazil with a paltry 67 tonnes (ranked 41st in the world in terms of gold holdings) equals $3.4 Billion or less than 1% held as gold. A pattern is beginning to emerge: the largest accumulators of the new paper money being printed up by all the global central banks have the smallest current percentage of gold reserves when measured against their total forex reserves. The top 5 holders of gold globally (with the exception of the IMF) are all in the money printing, deficit spending, releveraging camp, and they are not selling any gold!! When the choice comes up, between taking more paper reserves or taking gold, almost all central banks have determined they want more gold. The only reason China has not massively increased its holdings of gold from where they are today is that there just is not enough physical supply to accommodate them. The unlimited central bank physical gold buying will continue for as long as the global printing presses continue to run. Central banks bought the most gold since 1964 last year just before the collapse in prices into a bear market underscored investors’ weakening faith in the world’s traditional store of value. Nations from Colombia to Greece to South Africa bought gold as prices rose for an 11th year in 2011, highlighting the reversal of a three-decade-long bout of selling that diminished the world’s biggest bullion hoard by 19 percent. The World Gold Council says they added 534.6 metric tons to reserves in 2012, the most in almost a half century, and expects purchases of 450 to 550 tons this year, valued now at as much as $25.3 billion. …The timing of the rout is surprising because the events that sustained the bull market in the last several years are still unresolved. Central banks are printing money on an unprecedented scale as they seek to boost growth, Europe’s debt crisis is spreading and the International Monetary Fund is among those getting more pessimistic on the global economic outlook. Yet investors are now shunning an asset traditionally seen as a hedge against currency devaluation and fiscal turmoil. Central banks owned 31,671 tons at the end of 2012, about 19 percent of all the metal ever mined, the London-based World Gold Council estimates. They accumulated the hoard over decades, with about 16 percent added in the 10 years through 1965, when prices were fixed at $35, or about $258 today once adjusted for U.S. inflation. President Richard Nixon formally ended the convertibility of dollars to gold in 1971. …Morgan Stanley expects central banks to buy another 655 tons through 2018, while the WGC anticipates purchases of at least 450 tons this year alone. The price slump may not deter them because of how much longer they typically hold assets relative to most investors. Russia and Kazakhstan expanded gold reserves for a sixth month in March, International Monetary Fund data showed today. Russian holdings rose 4.7 tons to 981.6 tons and Kazakhstan’s hoard grew 1.2 tons to 122.9 tons. …The plunge has encouraged some investors to buy more. The U.S. Mint said this week it ran out of its smallest American Eagle gold coin and purchases from the Perth Mint in Australia doubled. Standard Chartered Plc’s sales to India last week exceeded the previous record by 20 percent and UBS AG says physical flows there are near the highest since 2008. Price swings are an “unavoidable risk” and aren’t a “big concern” because gold is a long-term strategy for diversifying currency reserves, the Bank of Korea said in a statement April 16. The central bank almost doubled its holdings to 104.4 tons by the end of March from a year earlier, still only equal to 1.6 percent of all its foreign reserves, WGC data show. While the drop in prices is “extremely concerning,” the South Africa Reserve Bank won’t adjust its reserve policy, Governor Gill Marcus told reporters April 16. The bank holds 125.1 tons, little changed over the past decade. Gold traded in rand dropped about 17 percent since reaching a record Oct. 8. The slump means Sri Lanka will “favorably” consider buying more, central bank Governor Ajith Nivard Cabraal said in a Bloomberg Television interview April 16. The nation has 3.6 tons of reserves, from 11.6 tons when prices peaked in 2011, according to WGC data. ... Hedge funds trimmed bullish bets on gold by 40 percent this year, U.S. Commodity Futures Trading Commission data show. Holdings in ETPs contracted 13 percent to 2,299 tons, which combined with the price slump erased almost $36 billion from their combined value. The slump into a bear market happened three days after a European Commission debt assessment said Cyprus had committed to sell about 400 million euros ($523 million) of gold. While the Cypriot central bank, ranking 61st globally for reserves, said it hadn’t discussed such plans, it spurred speculation that other distressed European economies would do the same. Portugal (182.046), Spain, Italy and Greece own 3,228 tons. The U.S. and Germany are the biggest owners, with gold accounting for more than 70 percent of their total reserves. Both kept holdings little changed in the past decade. The U.S. officially values its bullion at $42.2222 an ounce. THERE IS NO POSSIBLE WAY TO EQUALIZE INCREMENTAL DEMAND WITH AVAILABLE SUPPLY. AS WE HAVE SEEN, THE MINERS ARE PRODUCING EVERY LAST OUNCE THEY ARE ABLE TO, AND THEY HAVE NOT BEEN ABLE TO INCREASE THE SUPPLY COMING OUT OF THE GROUND MORE THAN 1-2% PER YEAR, IN THE FACE OF A 7X INCREASE IN THE PRICE. THE BIG HOLDERS OF EXISTING GOLD ARE NOT SELLING, INSTEAD THEY ARE PRINTING UP EVER MORE PAPER CURRENCY TO GIVE TO THE SURPLUS FX NATIONS. THE PAPER SURPLUS CENTRAL BANKS ARE SWAPPING THEIR INCREASINGLY UNWANTED PAPER FOR GOLD AT EVERY CHANCE THEY GET, AND THEY AREN’T GETTING MANY CHANCES. THE SUPPLY IS MASSIVELY CONSTRAINED, AND DEMAND HAS TO BE PRACTICALLY INFINITE. What is the right way to value gold? 11.) demand for gold has been coming from retail investors for jewelry and central bankers. China and India are the two largest consumers of gold annually, and account for more than 51% of current total annual gold consumption. As per capita income continues to rise in the BRIC’s and other frontier markets, and the global money supply continues to expand, gold demand will remain robust, and gold will maintain its long term purchasing power. So where else is the gold demand coming from, aside from the central banks? India and China make up over half the annual demand currently, with no signs of slowing down. This is mainly retail driven demand, but also includes central bank purchases. It is a global phenomenon, driven by consumers in the increasingly affluent BRIC and other emerging countries. …Trends in demand for gold in India. …More recently, the uncertainty in real estate and equity markets has made gold an attractive investment and that, in turn, is making gold a convenient option. The economic growth, lack of easy availability of alternative financial products, particularly in the rural areas, has ensured that demand for gold is beyond normal needs for jewellery. Recently, Jagirdar and Jain have estimated that for every 1 per cent increase in income, gold consumption increases by 1.5 per cent, showing that gold consumption is highly income elastic. There are two components of demand for gold. The first category of the demand for gold consists of the ‘consumption’ demand for making jewellery, medals, electrical components, etc. The second category is the ‘asset’ demand for gold as an investment. The asset demand for gold is based on a number of factors, such as to serve as a hedge against inflation, as a suitable asset to aid in portfolio diversification and similar objectives. Gold is perceived as ‘safe haven’ asset, especially, during periods of financial and economic stress. Gold is viewed as a liquid asset and one of the most efficient ‘store of value’ and hence widely recognized in India as a tool for inter-generational wealth transfer. However, gold jewellery can also serve as a liquid asset which can be pledged for tiding over short term contingencies, which may increase the demand for gold imports…. Demand for Gold has been ramping up steadily from China as well, as can be seen on Chart 36. The chart shows monthly imports through Hong Kong in terms of metric tonnes from 2009 to 1/31/2013. Demand shows no signs of softening…. China by itself has been absorbing between 50 – 100 metric tonnes per month over the last twelve months alone…. Jewelry demand by the emerging affluent consumers in the developing world and the demand by Central Bankers to shift reserves away from increasingly unattractive paper appear to us to be providing ample incremental underpinning for the solid global demand for gold. We have annual new supply from the miners coming in at about 2,850 metric tonnes (chart 28). We have scrap supply or recycled gold of approximately 1,500 metric tonnes (page 42). Total annual available supply of gold therefore would appear to be about 4,350 metric tonnes. That equates to about 2.5% of our total all time supply of about 170,000 metric tonnes. The growth in total supply is simply what is mined out of the ground (excluding recycling) divided by the 170,000 total which comes to 1.67% growth per year. This supply/demand forecast allows “room” for central bankers to buy roughly 500 metric tonnes (about $25 billion) in gold, without competing with the other demand as shown above. 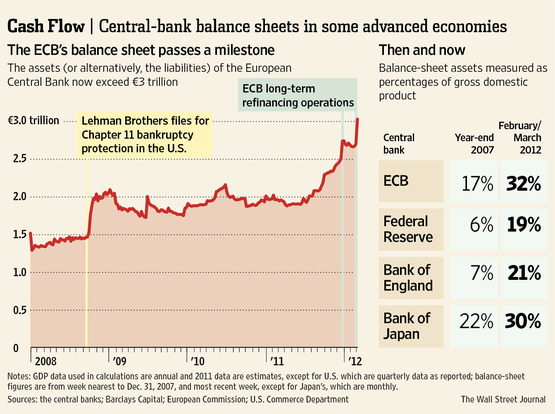 Paper Central Bank reserves currently stand at $11 trillion and are growing at about 17% per year (Chart 31). That’s $1.87 thousand billion a year ($1.8 trillion) in new paper being created by the deficit spenders and accumulated by the surplus nations. So my question to you is, what would you do if you were sitting on a pile of paper that size and being drenched with ever more? Our estimated $25 billion “plug” of central bank buying above equates to putting less than 2% of the estimated annual global increase in paper reserves ($1,870 billion) into gold. Gold miners in this case being represented by the yellow line, which is a chart of the exchange traded fund GDX. GDX is made up of a composite of the large cap gold mining stocks, including Barrick and Newmont. Since the beginning of 2008, gold itself is up by 69% while the gold miners have actually fallen in value by 32%. There are many issues plaguing the mining industry, from rising labor costs, rising governmental resource nationalism, rising energy costs, unwise acquisitions, poor capital allocation strategies and declining grades of ore from existing mines. A sampling of some research from Bloomberg on the mining sector indicates that reserve grades have deteriorated from between 15% to 78% over the past decade for Rio Tinto, AngloGold Ashanti, Gold Fields, Harmony Gold and Impala Platinum holdings among others….. It is likely safe to infer that most gold miners are facing the same problem of declining grades of ore in their existing mines, and that the total annual supply of freshly mined new gold is not likely to expand in any meaningful way from past trends anytime in the near future. Fully loaded extraction costs have continued to rise inexorably over the last decade. As gold prices have come off to the $1400 – 1500 per ounce level, the industry is facing tremendous margin pressure. The financial markets have virtually shut down for gold mining companies, as they cannot issue stock or debt at current depressed levels. A serious cash crunch and concomitant financing crisis is engulfing the industry…..
Amazingly, in spite of all the bullish fundamental analysis we have waded through, gold at present is being pilloried in the financial markets, and sentiment is now as low as it has ever been over the last 15 years. The fickle, fad of the moment, investing public has completely abandoned it. To our contrarian minds, that would appear to be the most bullish argument on gold of all. Is there a bear case to be made anywhere for gold? We can think of two. Europe and the Euro have not solved their currency problem to date. The Euro as a currency was conceptually flawed from the beginning in that there were no exit or enforcement mechanisms built into it to compel compliance or expel non-conforming countries like Greece. The weaker members who joined it now find themselves in the position of a third world country that has become over-indebted in a hard currency. They cannot individually resort to either devaluation or printing money; and as a result the only policy option open to them is adoption of politically very unpopular austerity measures aimed at deflating internal wages and asset prices. Eventually, the social order in some of those countries pursuing harsh austerity measures could deteriorate, to the point of bringing on a whole new crisis in Europe. You could make the case that at some point, the ECB or other Euro nations may have to sell off some of their physical gold in order to restore local financial markets. Even should this eventuality materialize, we believe there still would be enough emerging market physical demand for reasons outlined above to absorb any incremental European selling. The second would be if some governments decide to become more activist in reducing the amount of gold the public can hold. India in particular is very worried about the effects of gold imports on its current account and exchange rates. This is a very real possibility should gold continue its meteoric rise…. 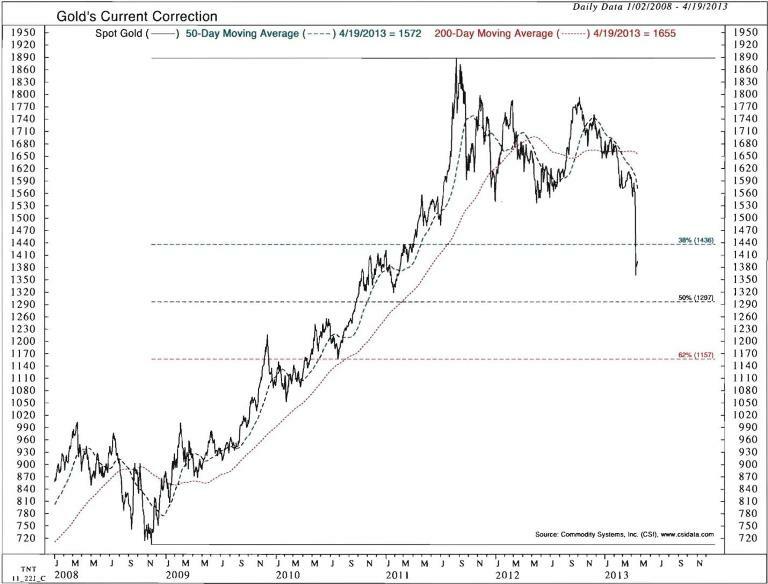 We believe, as we said at the very beginning, that technically speaking, the price of gold has ‘broken down’ and $1530 will be the new resistance to the upside. We think that it will back and fill in a trading range, and could conceivably go as low as $1100/oz, although that is not likely. Our best guess is $1250 -1300 will be a good level to start accumulating. One important thing to understand about the gold market is the price moves around on relatively low volume when compared to the massive pent up demand in the central banking world. Speculators and Central Bankers travel in very different circles with very different price dynamics. The “market” price is very likely to be jerked around quite a bit both up and down on low real total volume by the speculators in the futures pits and the hedge funds trying to pick each other’s pockets. The Central Banks are not trying to pick up ounces here and there, they are trying to buy by the metric tonne, and there is simply no tonnage of any size to be had at the moment. With ultimately constrained incremental supply, continued global paper money stock expansion and ever rising emerging market retail demand, this trade will come back in a big way from the long side. As far as the miners go, the whole industry is entering a massive capital structure restructuring phase. The guys with good balance sheets and well-honed capital budgeting skills will win, and many others will have to be acquired or go bankrupt, as conventional finance has all but dried up for the whole industry. The best way to play the miners is probably in a long/short format, as opposed to going outright long only at this juncture. In sum, Central bankers and governments globally as we have demonstrated are all being “forced” into joining the money printing game. Global liquidity in terms of new, incremental “paper” will continue to expand at a dizzying pace. Bonds, representing 2/3 of global investable assets, have become a toxic asymmetrical one way trade. Central banks, as well as Institutional and Retail investors will continue to be highly incentivized to diversify out of increasingly abundant paper reserves into other asset classes to preserve purchasing power, such as global equities and gold. Gold will shine again, and equities look like a much smarter long term investment than bonds. Source: Wikipedia contributors, "Monetary base," Wikipedia, The Free Encyclopedia, http://en.wikipedia.org/w/index.php?title=Monetary_base&oldid=547958699 (accessed April 27, 2013). Bloomberg By Debarati Roy, Maria Kolesnikova & Phoebe Sedgman - Apr 25, 2013 2:33 PM PT.